Android is a popular operating system designed to run on smartphones and tablet computers. As the demand for mobile devices grow, the demand for creating and displaying barcodes on applications running on these mobile devices also increases. Some of the common use cases of using barcodes on mobile devices include printing barcodes for ticketing, document tracking and barcode labeling. Applications in Android are developed in the Java programming language using the Android Software Development Kit. ConnectCode Barcode Software and Fonts supports the creation of barcodes on many mobile devices including Android using barcode web fonts. It also supports the creation of barcodes in Android Applications using Java and True Type fonts. The class library enables the verification of input data, addition of barcode check digits and start/stop characters quickly and easily. With the use of fonts (instead of images), a resolution independent barcode that meets the strictest industry requirements can be easily created in Android Applications. The complete documentation of the class library can be found in the help file of the software package. 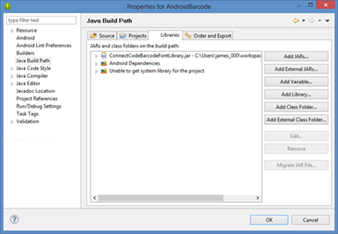 This tutorial assumes the creation of a new Android Application Project and uses Android Developer Tools v21.0.1. It also provides pointers on bundling the Barcode Fonts and referencing the Java Class Library. Android developers can also use the following as a reference to add industrial strength barcode capabilities into their own applications. Download, install and launch Eclipse - Android Developer Tools (ADT). Go to the menu File -> New -> Android Application Project. Enter "AndriodBarcode" as the name of the application. Select API 12: Android 3.1 (Honeycomb) as the minimum Required SDK. Though ConnectCode also works with earlier version of the Android SDK, we only certify and provide official support for Android 3.1 onwards. Click on the Next button until the Create Activity screen and select the MasterDetailFlow activity. Click Next and Finish. Now add the Java Class Library. Go to Project -> Properties -> Java build Path and select the Libraries tab. Click on the Add External JARs button. Select the ConnectCodeBarcodeFontLibrary.jar (in the Resource\Java subdirectory of ConnectCode). Go to the Order and Export tab. Check the ConnectCodeBarcodeFontLibrary.jar. Click OK to return to the main screen. You will notice that a Referenced Libraries folder with the ConnectCode Class Library is added to Package Explorer. Select and click on AndroidManifest.xml in Package Explorer. Add the following line to the application tags. After the files are copied, Eclipse will detect and display the files in the Package Explorer as shown below. Sometimes, you may need to right click on the barcodefonts folder and select Refresh to see the added files. 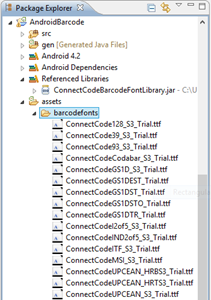 In Package Explorer, click on the src -> com.example.androidbarcode -> ItemDetailFragment.java file. Locate the onCreateView function. The programming codes above uses the Java Barcode Class Library and barcode fonts Typeface to generate barcodes. A complete listing of the codes can be found at ItemDetailFragment. Note : The horizontal markings on the barcodes will only appear in the trial version of the software.